A pretty-in-pink entry into hospitality from a gourmet icon. 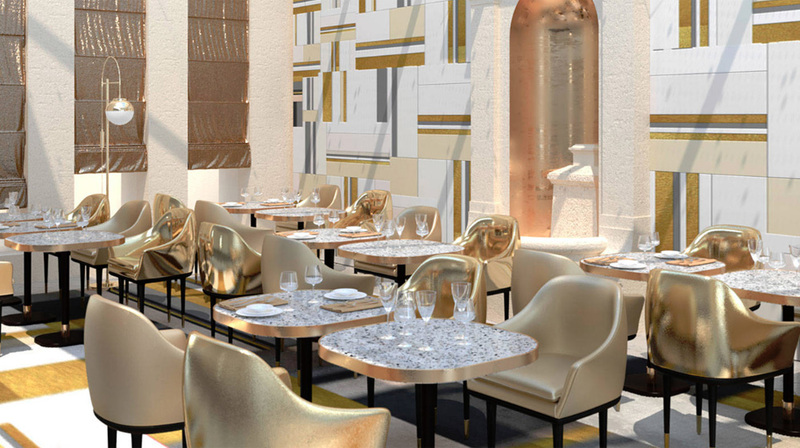 The FAUCHON food brand has expanded into the luxury hotel space for the first time with the opening of the five-star FAUCHON L’Hotel, a member of The Leading Hotels of the World. 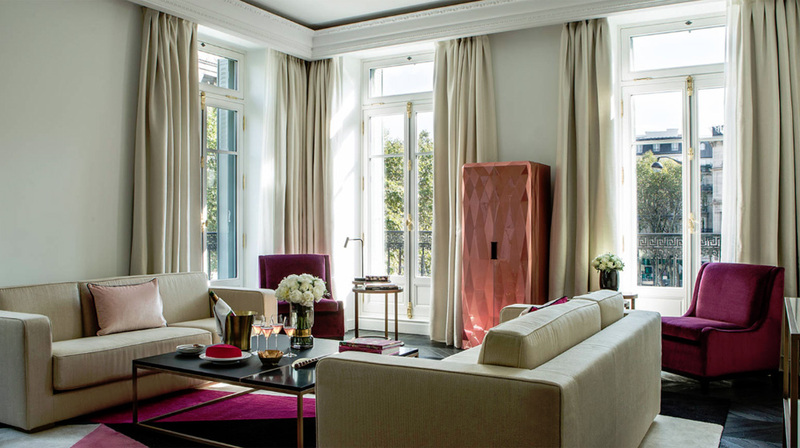 The 54-room and -suite FAUCHON L’Hotel Paris is positioned in one of the most beautiful Haussmanian buildings of its kind in the city, which features original mouldings, doors and balconies, amid other design elements. 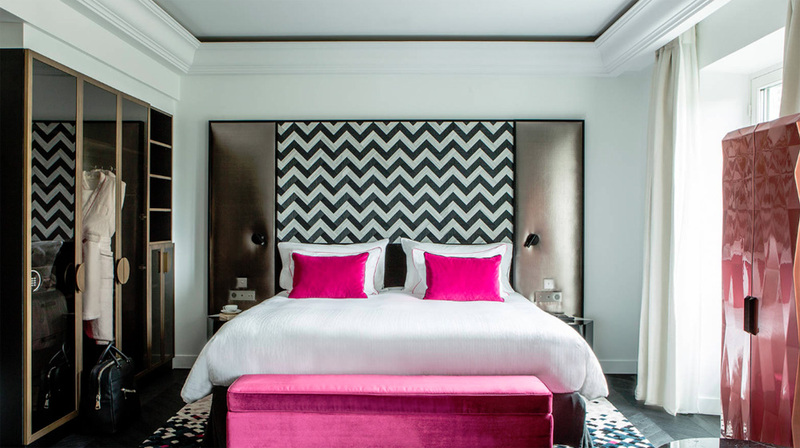 In the guest rooms and suites, the design alternates powder-pink velvet accessories with straight curves and rock variations, black herringbone floors and carefully restored Parisian shutters. Everywhere, a selection of artwork represents the characteristic cheekiness of Maison FAUCHON. Small touches incorporate the charm of Fauchon: gold threads run inside the shower screens, carpets have been custom designed with the graphic fonts of the house, and light fixtures have been sourced to provide a mood that combines functional intelligence with ambience, only to create an entirely different ambience as day turns to evening. Originally founded in 1886 by Auguste Fauchon, the brand continues to evolve its role as “an innovator and global ambassador of French luxury and cuisine,” the company said. The property is centred around the pillars of “G.L.A.M.” to create a multi-sensory experience. G is for GOURMET: The most creative Parisian patisserie adhering to the French culinary tradition. Gastronomy has been the signature of Maison Fauchon and it is represented throughout the hotel in Glam’Hours, the Gourmet Bar, and even the in-room Gourmet Moments, which invite guests to experience indulgent surprises in their room. L is for LOCATION: At the heart of the urban life of the city. Situated in the most glamorous and celebrated of all the Paris districts — the 8th Arrondissement — life here is decidedly more sophisticated, more spectacular, more sublime. It is the seat of power: the headquarters of wealth, commerce, sophistication, culture, gastronomy and architecture. It is also at the cradle of Maison Fauchon on the Place de la Madeleine. A is for ATTENTION: Attention and experiences, which are bespoke, far beyond the usual hospitality services. Attention has been focused on the concept that the sum of small pleasures makes all of the difference. Enjoy the landscape of the Seine from the wheel of a small mahogany boat emblazoned with the name of the hotel. Enjoy exclusive access behind the scenes at the major Paris “show biz” venues. Perhaps a guest would prefer a tasting of prestigious vintages, a designer fashion show in their suite, or to experience special access to places that are quite often inaccessible for most travellers. 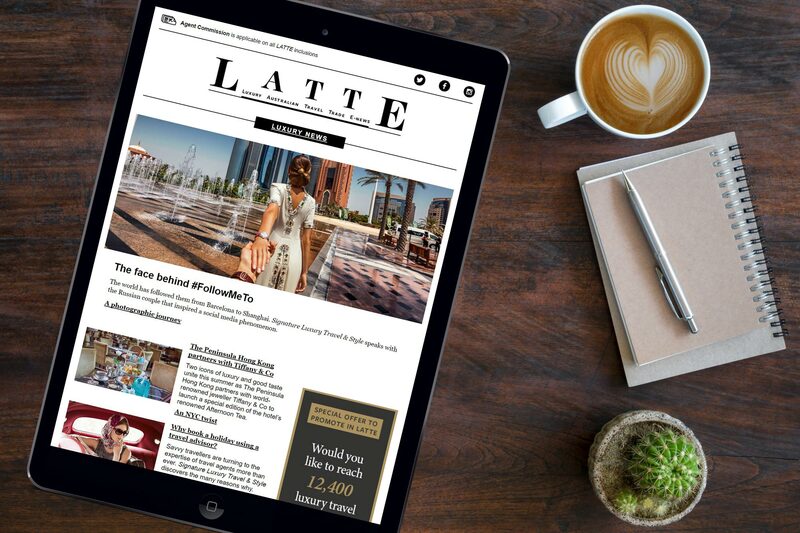 M is for MESDAMES: A hotel always in tune with women featuring sophisticated lighting, Dyson hairdryers, properly sized bathrobes, Carita amenities and more. Fauchon’s philosophy is that all women — whatever their profile and style or traditions and ambitions — feel at ease, pampered and privileged through a multitude of details (flattering light, adapted maps, service protocol, etc.). All of this welcoming finesse is delivered without ever excluding men. Just like the many districts of Paris, the accommodations at the FAUCHON L’Hotel Paris each have their own personality. With a total of 54 guest rooms and suites — 37 rooms and 17 suites — they have varying character traits including vaults, balconies and bow windows, yet all have a common luxury: Paris city views. 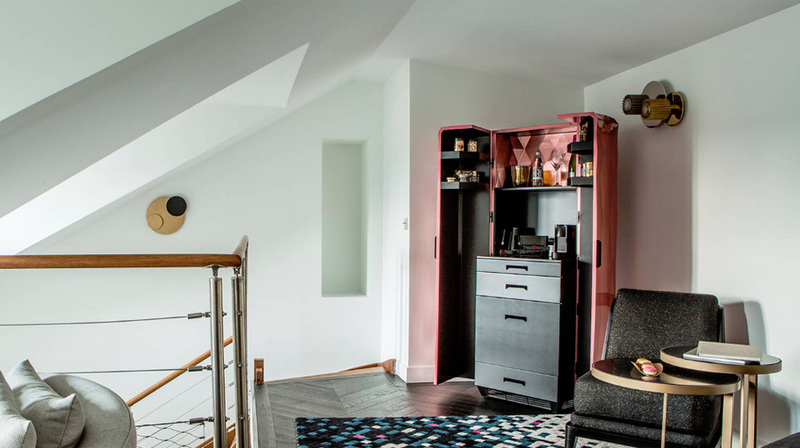 Designed to replicate typical Parisian apartments, some suites have their own lounge (which adapts to accommodate a chef) and enables a Chef FAUCHON to come into the suite and demonstrate their gastronomic talents by preparing a special meal en suite. 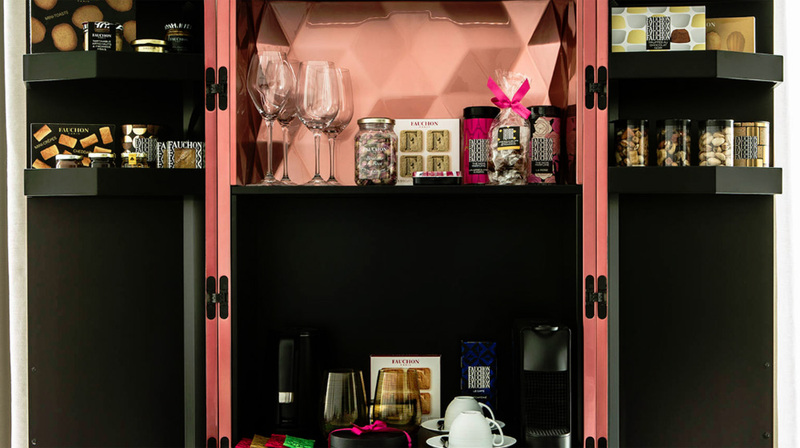 FAUCHON L’Hotel Paris has disrupted the hospitality industry by reimagining the typical in-room mini-bar. The epitome of the hotel’s commitment to creating a centrepiece of gastronomy, the Gourmet Bar is a custom pink armoire designed by Sacha Lakic and produced by the House Roche-Bobois. As attractive as it is functional, this stunning piece of furniture (also available for guest purchase worldwide) facilitates incomparable gratification. Within the many doors and drawers, guests can enjoy unique moments of pure decadence as they seek and savour favourite Fauchon delicacies. As a special gift, Fauchon offers complimentary fresh Fauchon creations upon arrival to suit all taste preferences. The company will customise the contents according to a guest’s preference: salty, sweet, healthy or tasting (a combination of all three). The Gourmet Bar includes a “fresh product” cabinet for pastry, chocolates and foie gras, as well as a preview of other Fauchon specialties all kept at the ideal temperature. The “drinks” cabinet is the perfect spot to hold wine, spirits, champagne, water, juices and soft drinks. There is a special area for sweet and savoury Fauchon snacks – just perfect for an afternoon nibble – as well as an area to enclose the hot water kettle and Nespresso coffee machine for Fauchon tea, coffee and hot chocolate. Most items are complimentary and some are available for purchase. 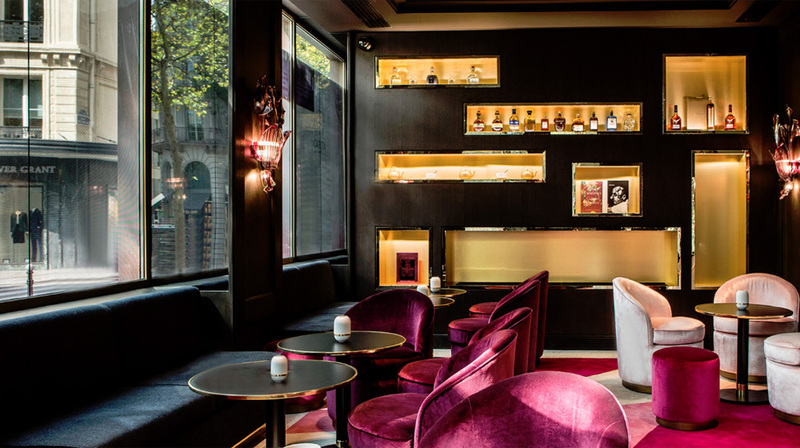 With a desire to offer an intimate, expert and epicurean moment for wellbeing, FAUCHON L’Hotel Paris has chosen a renowned Parisian house of beauty focused on pleasure: Carita. A family enterprise, well known to Parisians and echoing the values of the House FAUCHON, Carita amenities are offered in-room in a selection of miniatures. The Carita Spa at the hotel, imagined as a showcase, has a hammam and two treatment rooms available to both guests and local Parisians. Carita offers expert care in beauty and anti-ageing. Carita’s philosophy is centred upon the radiance of the complexion, letting go and taking pleasure in caring for one’s self. For more information, see FAUCHON L’Hotel Paris.